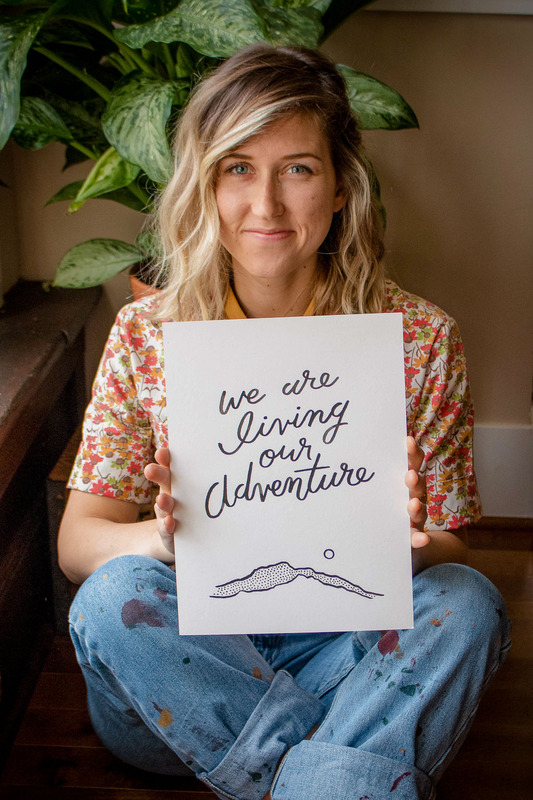 Creator's Corner: Pretty Bird Paper Co.
Seattle-based creative Mollie Thompson has consistently followed her creative curiosities- whether it was sewing, scrapbooking or writing poetry. 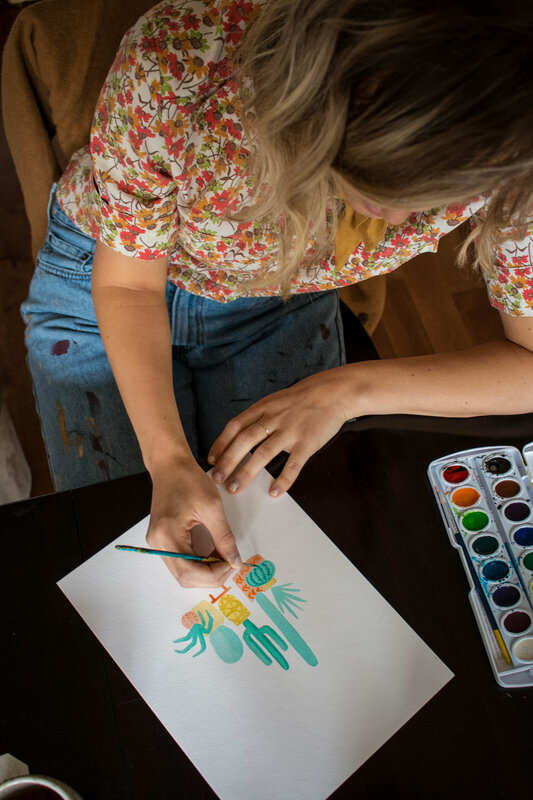 Here, Mollie reflects on her creatively fueled childhood, how her friends influenced her decision to start a business, and how she hopes people connect and find joy in her art. Tell us a little about your creative background: I probably have to thank both my parents for this one. My graphic designer mom (am I predictable?) had me sewing my own dresses and decorating birthday cakes about as early as one can. My astronomer dad encouraged my imagination, taking me out in nature and turning normal objects into fun or hilarious ones. Honestly, my family is kind of composed of geniuses, so I grew up valuing the power of my mind in a very different way than I do now. I never took art classes in school because I actually wanted to be a doctor or a book publisher! My outlet was mainly writing stories and poetry, but I was always creatively active in various ways. My nickname in my family is actually “MooMoo the Maker” because more often than not I had some project sprawling across my bedroom floor or the dining table. I made scrapbooks, painted Russian stacking dolls, and was famous in 7th grade for my cereal box flip flops I gave to friends on their birthdays (super cool). I was always up too late making a mess, so it’s funny in retrospect that I didn’t know from an earlier age what I should do with my life. What was the moment you knew painting (and graphic design?) was what you wanted to focus on? Graphic design came to me by a total fluke. I was in a club at my high school where I had to decorate a banner, and of course I was all into it. My dad walks in the room and says, “You should be a designer for Disneyland!” It was so obvious! So the next year at college I took the Design intro class and got into the major. You might think the rest is history, but I actually decided to study Industrial Design because I was still set on Disney Imagineering. (Which, by the way, I may never achieve, but will probably never stop entertaining.) Over the next couple of years I did a few graphic design internships that shifted my passion into that realm. Painting came by way of seeing cute illustrations on Instagram— before I even had that darned app, and was looking at a friend’s phone—and thinking “I want to do that!” So I went to the craft store, got the cheapest watercolors I could find, and started to practice. I was never terrible, but I will say that I was not great. Everything took me a super long time in the beginning, but I loved the peaceful feeling of painting and loved the outcome, so I just kept doing it! When and why did you create Pretty Bird Paper Co? I officially launched the Pretty Bird website in April of 2016. I think 500 people had to ask me 3 times each where they could buy something of mine before I put anything online. I knew I loved to paint, but it was just that—I never had the ambition to start an actual business, I just wanted to do it because I enjoyed it. Once my friends convinced me it was worth pursuing, I had to come up with the name before I could do anything else (perfectionists, I see you). It "just came to me” as those kinds of things so often do, as I was driving home from work one day and thinking “I don’t want to name it after myself, so what do I like? Well, I like birds. I like pretty birds.” I got home, grabbed my paints, and made the logo that day. I don’t think a business can ever be “done”, but I did get business cards this summer, so I guess I’m pretty official. What influences your creativity? Everything influences my creativity! Poems by Maya Angelou and Mary Oliver that I can’t help but paint. Disney movies, Twin Peaks, funny encounters with people on the street, little adventures, and listening to music that makes me feel something. The work of other creatives definitely lights my mind on fire in the best way. Spending time in peaceful nature fills up half of my tank, and time with people fills up the other. The more I feel like myself, the more that I create. You have to take stuff in to put stuff out. I know how eloquent that sounds. But really, it’s worth it to put down work to watch the sunset. It fills you with light that you can mix into your paints! Do you have creative habits or rituals that help you stay focused? No. I probably should, but I love mixing things up. Not to discount the value of a routine, I just don’t work that into my creative process. I will say, if I’m listening to a good podcast I can definitely sit still a lot longer. What is your proudest moment in your creative journey so far? Every time someone tells me they received one of my cards— especially when I’m just meeting them— that is my happiest moment. I don’t know that I’d even call it pride, but it’s such a wonderful feeling to know that my art is being shared between loved ones. I’ve met parents, girlfriends, and husbands who have been introduced to me as the maker of “that card” they received, and they are genuinely so thankful. In those moments I don’t care if I ever make a dollar off of this. I love that people connect and find joy and beauty in my art, and I love even more that they use it to connect with others. When was the last time you weren’t over the moon about a card in the mail? It’s an instant day-maker, and it shows thought, time, and love. Are you creatively satisfied? Yes! And no! And sometimes! There are days when work feels like work and it’s the total grind. And there are days when it’s so rewarding and fun and I can’t believe I get to live off of it. Getting to survive off of something you love to do is an incredible privilege and not one I take lightly. At the end of the day, I don’t think it matters if I am always satisfied. I am satisfied because even on the hard days, I’m a damn lucky girl, and I get to use that to brighten up other people's lives and make a difference in a way that truly no one else can. What's next for you? I keep trying my best. Check out Mollie's whimsical water colors on her website and give her a follow on Instagram.